Denver Offers 5,280 Free B-cycle Passes. Get Yours ASAP. Courtesy of Denver B-cycle (Facebook). 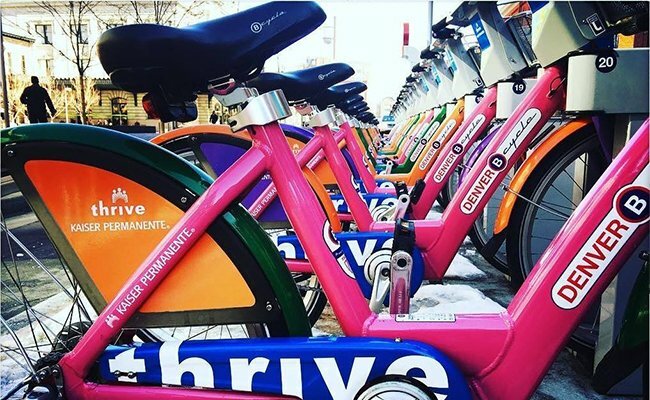 5,280 Free Rides program allows unlimited, 60-minute B-cycle rides through Dec. 31, 2019. Denver is taking steps to get cars off the road and ease transportation road by partnering with B-cycle, a system of rental bikes throughout the city. It's all part of Mayor Hancock's Mobility Action Plan to get single-use vehicles off the road by increasing the number of people who commute by public transportation, bike, or walking. The city is now offering 5,280 B-cycle passes for free to Denver residents in hopes it will encourage people to leave their cars at home. If you get one of these passes, you will receive unlimited 60-minute B-cycle rides until the end of 2019. There are 89 stations and more than 700 bicycles in the metro area system. Mayor Michael Hancock, Denver Public Works Executive Director Eulois Cleckley and B-Cycle Executive Director Mike Pletsch announced the news at the 14th and Zuni bike-share station Wednesday. Go to B-cycle's website to claim your pass. They will be distributed on a first-come-first-serve basis, so signing up ASAP will give you the best chance of getting a pass. You must be a Denver resident, and the city also announced that is working with community organizations to ensure low-income residents will have a chance to receive one, as well. Free helmets are also available to low-income residents while supplies last. See the website for more details on qualifying. Denver Public Works is providing the funds for the passes. A valid Colorado driver's license or valid identification card issued by the Colorado Department of Revenue that shows the current name and address of the resident. A copy of a current (within the last 30 days) utility bill, bank statement, government check, paycheck, or other government document that shows the current name and address of the resident.